I first reached the Whippet Appreciation Society (WAS) on Facebook about a year ago. It was the fourth year I was studying abroad in the United Kingdom, and I was missing my own whippet boy, Vodka, desperately. So I typed in “Whippet” in the search box on Facebook and came across this wondrous whippet Facebook community. WAS is a closed Facebook group, so when I got accepted by Serge the Whippet (aka Serge Arditti), our group administrator, I was overjoyed and began scrolling through pages and pages of beautiful Whippet pictures. 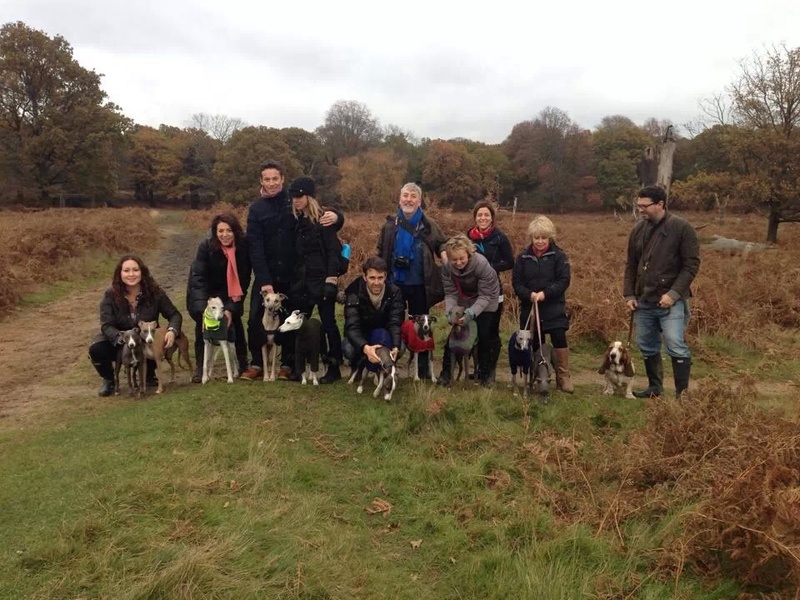 In January 2014, I saw a post on WAS about a Monthly Whippet Walk held in Richmond Park. Desperate for whippet kisses, I commented in the group instantly and asked to join the Whippet Walk that month. Abigail, the amiable organiser of the Monthly Whippet Walk, replied and said that the whippet walks are open to anyone who are available to join, even if you don’t have a whippet to walk. I was thrilled upon hearing this and just couldn’t wait till meeting all the beautiful whippets. On the day of the event, I woke up super early, and arrived the Richmond Park Sheen Gate at 10:30am where several whippets and their parents were already waiting. I got introduced to Serge and mom, Samantha, and Abigail where we started the 2-hour whippet walk. Serge and his friends ran free and wild for the whole of two hours, running into the mud and grass – little did they know what was in store for them after the walk – a hot hot shower to wash off all the mud and muck! For the two hours of walking, I got to chat with Samantha, and her efforts put into maintaining such a large Facebook Group. In January 2014, WAS had just over 10,000 members on Facebook. By now, WAS has over 16,000 members on Facebook from all over the world. I guess its self explanatory considering how ‘pup-ular’ whippets are across the globe! WAS initially started as an interest group for those who are in love with whippets, but as the numbers grew in members, Samantha has had to spend a great deal of time to manage this page. 15 hours is a huge dedication, but her efforts do pay off! Sometimes WAS do get some nasty comments from hasty individuals, but WAS is relatively free of ‘keyboard warriors’ and a very harmonious platform for whippet owners to share their joy and to ask questions and advice from other whippet-parents. WAS is a place not only for us to show our love for whippets, but to also share our compassion to others who need the extra support when they’re going through a hard time with their whippet. Its a platform where we can expect to get constructive advice and feedback from those who are undergoing the same situation or simply a place where we can gain support to go through hard times. We had such a great time at the Whippet Walks!